The portable Lego games have gone from titles that I would pick up with a sense of trepidation, to something that I now look forward to because they just keep getting better. After hitting a low point with 2013’s Lego Marvel Super Heroes: Universe in Peril, which got as far away from the Lego formula as you can get, things took a sharp turn upwards with Lego Batman 3: Beyond Gotham as it felt much closer to a Lego game you would find on a console and in some cases, did things better than what was on more powerful platforms. 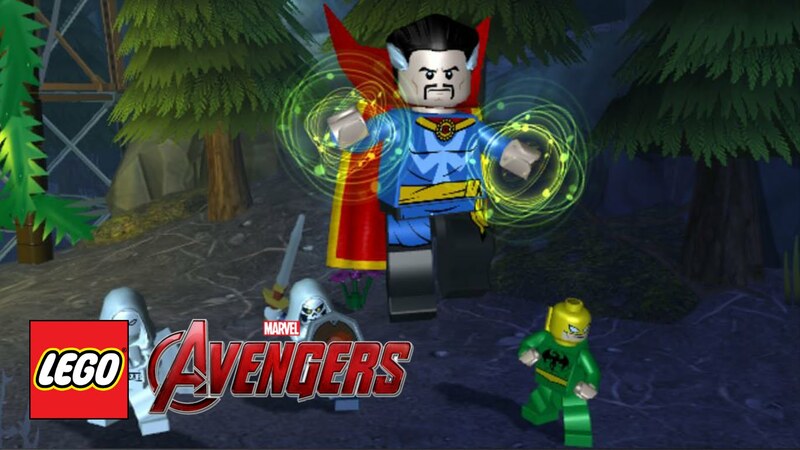 Lego Marvel’s The Avengers continues the upward trend of quality in the portable Lego games and is the closest the handheld installments have come in matching the amount of content found elsewhere. It also so happens to be the best Lego game on the 3DS thus far and a must purchase if you liked the console game or a are a huge Marvel fan. 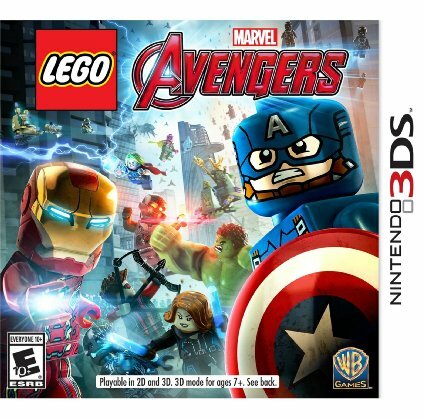 The 3DS version follows a similar plot structure as the console game, retelling the events of The Avengers and its sequel Avengers: Age of Ultron with a brief flashback to Captain America: The First Avenger in-between. Missing here are the stages inspired by the three Phase Two films: Iron Man 3, Thor: The Dark World and Captain America: The Winter Soldier but it was something that frankly not missed that much. The story here is still told out of sorts, but as the Phase Two levels could be played in any order and had to be sought out in the open-world on the console game, events here play out in a much more linear and easier to follow fashion. Though the story is more or less the same, the levels layouts are completely different from the console game which is a huge plus to the 3DS version of Lego Marvel’s The Avengers. I played this game concurrently with the PS4 version and never felt like I was treading through familiar territory even though I was in some respects. What’s brilliant about the 3DS game is how the missions seque into one another. In the first Avengers film there’s a section where Captain America goes in search of Hydra weapons on the S.H.I.E.L.D heli-carrier and in this game it’s a pre-mission objective. Another great transition is towards the climax when the Vision cuts off Ultron from using the internet as an escape route and to do so you play a mission as the Vision within Ultron that’s like something out of Disney’s Tron. I’d like to think that these intermissions between missions are developer TT Fusion’s way of making up for the lack of Phase Two stages and it’s a pretty good trade-off. One of the cardinal sins found in Lego Marvel Super Heroes: Universe in Peril was that the game made you collect gold Lego bricks to unlock more stages. In order to collect these bricks, you had to complete level specific objectives like killing so many enemies or doing so within an alloted amount of time. This continued into Lego Batman 3: Beyond Gotham, however the way that game was structured you always ended up with more than enough gold bricks such that you never needed to replay any missions twice in your initial run through the campaign. 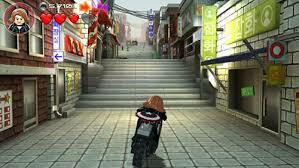 In Lego Marvel’s The Avengers this concept returns once again however it’s finally done in a way in which it should be. Level specific objectives take the place of mini-kit hunting and the amount of objectives you manage to complete doesn’t prevent you from moving on through the campaign. Everything else otherwise is business as usual for a Lego title: lots of punching bad guys, collecting Lego studs, assembling things to solve puzzles and using character abilities in tandem to get through levels. A selling point in the console game was the new team-up move that allowed characters to combine their abilities in spectacular finishing moves. It makes an appearance here, but is more or less used to solve puzzles and doesn’t have the high number of combinations of the console game. Some of the handheld specific team-ups are pretty clever though, like the Hulk hurling Captain America at an object in a fast-ball special like maneuver and having to use Black Widow’s lullaby to turn the Hulk back into Bruce Banner. I also liked some of the different uses the characters had that changed up their abilities. Captain America for example can ram objects with his mighty shield and some of the more obscure Iron Man armors are needed more in the campaign levels, like the Igor suit that makes him stronger or another that gives him Black Widow like invisibility. Something unfortunately lacking from the 3DS Lego games has been a fan-favourite part of the last few Lego games: an open-world. 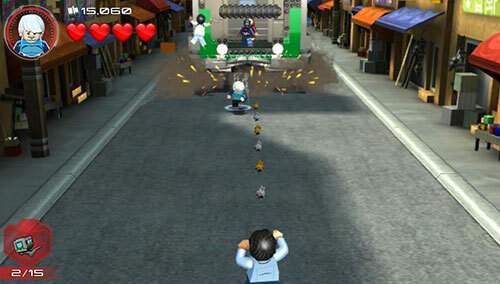 For the first time in a portable Lego game, one is present and while they’re aren’t as numerous as the console game: three variations on Manhattan; Avengers tower and the heli-carrier, nor quite as packed full of things to do, it’s still nonetheless great to be able to have an open-world Lego game you can play on the go. There’s plenty of races, characters to unlock, collectibles to hunt down, and even character specific missions featuring characters like Doctor Strange and Daredevil. Even though the open-world is present and a great first attempt, this portion of the game isn’t exactly perfect. The world is filled with less things and feels more empty for example, and the draw distance is very close to the point where you’ll get flashbacks to the PS1/N64 era. I don’t fault the developers for this though, as the 3DS hardware at this point is approaching five years of age and wasn’t that spectacularly powerful, even when it was new. Unfortunately I don’t own a PS Vita so I can’t comment on whether this is an issue inherent to just the 3DS SKU or both. When exploring the streets of Manhattan, there’s plenty of unlockable vehicles to ride in or you can simply just “borrow” a car from a civilian. If you want to take to the skies however, prepare to wrestle with the controls. A common complaint against Lego Marvel Super Heroes was the spotty flight control where ascending and descending were on face buttons, which is something that has been addressed greatly in games like Lego Dimensions and Lego Marvel’s The Avengers where these functions are now on the second analog stick. As the only 3DS SKU that has any form of second analog stuck is the New 3DS XL, flight controls are once again handled with the face buttons here. They do the trick for simple navigation, but when it comes to completing races that have a strict time-limit, things become a little more frustrating. Again, this isn’t the fault of the developer, but just simply the limitations of the 3DS hardware. Lego Marvel’s The Avengers is the closest TT Fusion has come to matching the robust experience found in the Lego console games with a decent length campaign and an open-world full of things to do once you’re done the story. Hardware limitations prevent the open-world portion from being as fully featured as the console game and navigation can be a chore at times, but when combined with the story, you’ve got a game that will occupy the cartridge slot of your 3DS for a long time. If you haven’t played a Lego game on a portable before, make this one your first, doubly so if you’re a fan of Marvel comics or the Marvel Cinematic Universe.